My work is varied and that's how I like it. One day I'm talking to someone like Gaggan Anand about why sheep's brain needs to be treated like foie gras, the next I'm conceiving menus for an art exhibition and experimenting with sorghum. Increasingly I'm devoting time to projects designed to shift public eating habits - you can see some of these at nourish.co.uk. I helped found the Great Taste Awards, took Ferran Adrià around Berwick Street market, learned to make noodles with a soba master in Shinjuku, chaired the Guild of Food Writers, and for several years was Time Out Eating & Drinking Guide's editor and most prolific restaurant critic. My books have been nominated for the major food writing prizes and featured on Richard & Judy's Book Club. The Sunday Times story of my engagement was the tipping point for online dating in the UK - David and I have since produced a daughter. We live in North London and Bath. My favourite food is peanut butter. From time to time I give talks on weighty matters like the significance of culinary ash, kimchee and doughnuts, and discreetly help other food professionals (including companies) express their ideas. I'm most useful on projects that require innovation, a fresh pair of eyes and a keen sense of humour. Drop me an email to make an enquiry. 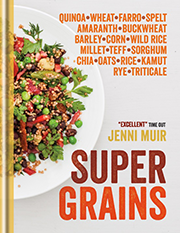 SuperGrains (Hamlyn) is the new incarnation of A Cook's Guide to Grains, which has been revised, extended and updated. You really do need to know about this stuff these days and my book is expressly designed to give you the confidence to use all sorts of grains in your own dishes. The aim is to get you cooking with a wider variety of grains, not to have a wide variety of grains sitting uneaten in the cupboard. Cook's Notes at the end of each recipe cover which grain swaps work best and myriad ways the dishes can be varied. I am very keen on the Further Fields section right up the back that looks at lesser-known ingredients such as black bean flour, lupins and urad dal too. The wonderful photography is by Liz and Max Haarala Hamilton with Kat Mead's food styling. Profiling high achievers of the restaurant world is, for me, one of the most enjoyable aspects of journalism. I also specialise in trend articles, whether bright and pacey consumer pieces or deeper analytical features for which my extensive trade experience comes in useful.